Why Does a New Ink Cartridge Shows Empty? Sometimes when you put a brand new ink cartridge in an inkjet printer, the screen shows that the cartridge is empty or not recognized. There are other messages that you might see, depending on the printer and software. The empty ink cartridge message may show up on the printer’s display or on the computer. Messages include “no cartridge,” “low ink,” “cartridge not recognized,” or some other condition that points to the new cartridges as the problem. I have even heard of printer software claiming the user just invalidated the printer warranty by inserting 3rd party ink cartridges. Are the new cartridges really empty? Are they really invalidating your printer warranty? Not likely, but it can happen on rare occasion due to defects. This happens most frequently with remanufactured or compatible inks and there are many reasons for it. In fact, many printer manufacturers go out of their way to make sure you get this supposed ‘error’ message. First of all, when you install the new ink cartridge, make sure the protective tape is removed. This protection usually covers the ink port and electrical contacts, if there are any. Always make sure you are replacing the right cartridge. If it still gives the error message, you may have another cartridge that needs attention. 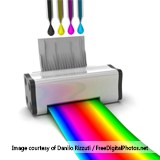 Even if you only need to use black ink for a print job, many printers insist that all cartridges have some ink. Also, make sure the contacts on the ink cartridge and printer are clean. You can use a paper towel with a little alcohol, a lint-free cloth, a special contact cleaning solution or even distilled water. If you use a liquid cleaner it is best to unplug the printer and then dry the surface that was wet with the cleaning solution before plugging it back in. Most of us love the modern conveniences that electronics give us, but they can also work against us. Printer manufacturers very often include chips in the ink cartridges that help keep track of ink usage and sometimes are used against your best cost saving intentions. For example, many chips are used to counts pages printed with an ink cartridge and then keep a record of that count. They do not actually measure ink levels. Refilling will not reset the level in the chip either. So, even if you put the cartridge in another printer, it will still report as empty. And if that is not enough, since some print heads presumably would be damaged if they run out of ink, the printer firmware or software reports the cartridge empty before it really is. I’ve seen many people comment that they figured out how to trick the printer into continuing to print with a cartridge that was showing out of ink and were able to print many more pages. In remanufactured cartridges, the chips sometimes have a record of how many pages were printed and they cannot be reset, even though the ink tank is refilled to maximum capacity. As a result the printer reads the chips and tells you that the cartridges are empty, even though they are not. Some printers will keep track of the last several ink cartridges by codes like serial numbers, so they can tell when you return to a cartridge it has already used. When that happens, the printer firmware of software will again complain about the ink cartridge with an error message. At times, manufacturers of compatible or remanufactured ink cartridges can install new chips or reset them. That helps eliminate the error messages. But not all the remanufactured cartridges can have their chips reset. As a result, you’ll have a full tank of ink, but the software will say it is all out. Just keep using the ink cartridge until the printouts show obvious signs of the ink running out. Do you really need that firmware update? In some cases, the printer manufacturers are constantly updating those chips in cartridges. They then upgrade the firmware and users get a message that there is an update available. Users of course feel they always need the latest firmware or software so they do the update. Then, suddenly the printer complains about the compatible or remanufactured ink cartridges that have been working fine in the printer. Do they really need to update those chips, or is it more about trying to keep users from buying keep third-party ink cartridges? You be the judge. If the printer was fine before a firmware update, it could have been intended just to get the printer to complain about ink cartridges that are not from that manufacturer. And what about those reports of users saying their printer said the third party ink just voided their warranty. This is simply not true in most cases, according to the Magnuson-Moss Warranty Improvement Act, as we note in the linked post. This would only be true if ink is spilled on delicate parts and it ruins them – rare since the printers are usually built to protect from that. Several manufactures spend a lot of money trying to convince users that only their original OEM supplies can be counted on. That is only partially true though because there are third-party supplies that are in fact very well made and reliable. But as with any market, there are also supplies that are junk and typically are sold at rock-bottom prices. So, if your printer complains about the cartridges being empty when you know they are new and filled to the brim, you have likely just experienced the printer manufacturer’s efforts to get you to buy only their original supplies. If you are willing to disregard the messages and continue using the ink cartridge until the prints show true signs of depletion, you are likely to save a fair amount of money on your supplies. ← What is Hard to Find Quality Color Printer Toner? And so that explains why some people are complaining about compatible inkjet cartridges even if it works to a lot of people. They just didn’t realize that those pop-up messages in the printer were just manufacturer’s scheme.